He dropped out of College to chase a dream and returned 12 years later as leader of a company that has changed the world. His goal now, he says, is to make that world become a better place in which to live, work, laugh, love, and connect, and to encourage others to do the same. After receiving an honorary degree Thursday morning, Facebook co-founder and CEO Mark Zuckerberg stood again in front of Memorial Church in Tercentenary Theatre during the afternoon and urged newly minted Harvard graduates to go out into life and make a difference, with purpose. “Today I want to talk about purpose,” he said. “But I’m not here to give you the standard Commencement about finding your purpose. We’re millennials. We try to do that instinctively. Instead, I’m here to tell you that finding your purpose isn’t enough. The challenge for our generation is to create a world where everyone has a sense of purpose. That’s a critical goal in a time of everyday change, said Zuckerberg. Increasing automation means the loss of jobs that had helped a generation find its voice and frame its values. Similarly, community connections, which also helped connect and define prior generations of Americans, are slowly slipping away, often leaving people bereft of meaning and paths forward. “A lot of people are feeling disconnected and depressed, and are trying to fill a void in their lives,” he said. Zuckerberg outlined three ways that Harvard graduates and others can help foster a world where everyone has a sense of purpose. First, he suggested big projects that get lots of people involved. In past generations, hundreds of thousands of people worked to put a man on the moon, and millions volunteered to help immunize children against polio. The world needs more thinkers and doers who can tackle similar, present-day challenges, said Zuckerberg. His third path to purpose, unsurprisingly, involves a concept he knows something about: building community. Similar to Bill Gates, another Harvard dropout turned tech billionaire, Zuckerberg, an entering member of the Class of 2006, left Cambridge in the fall of 2005 for Silicon Valley and never looked back. In Palo Alto, Calif., the young computer whiz transformed the company he had created with his roommates in his Kirkland House dorm room less than a year earlier into a revolutionary social media platform that has fundamentally reshaped how people connect with each other globally. Early in his talk, Zuckerberg poked fun at his Harvard track record. Zuckerberg also reminisced about his time at Harvard and his best memory, meeting another undergraduate at a going-away party in his honor. He said his College friends (and his parents) were certain he was about to be thrown out of Harvard for his actions in founding the precursor to Facebook, facemash.com, a controversial website that let people rate the attractiveness of fellow undergrads. At Facebook, Zuckerberg became the youngest self-made billionaire in history at age 23, overseeing a company that today lets close to 2 billion users share everything from baby pictures and birthday wishes to favorite recipes and political views. In recent years, he has dedicated more attention, and his fortune, to philanthropy. With Chan, he created the Chan Zuckerberg Initiative in 2015, backed by a promise to devote 99 percent of their earnings from Facebook stock shares to fund the organization’s mission of curing disease and promoting education. 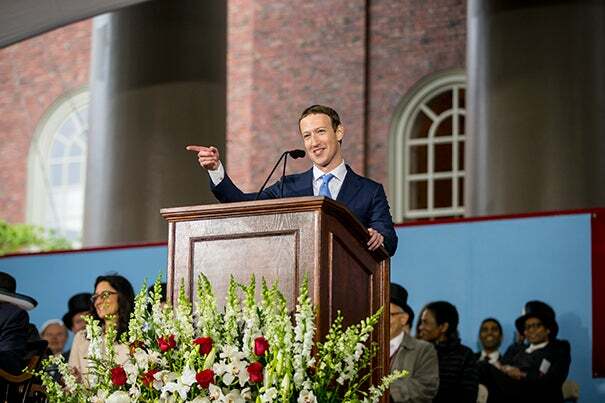 Zuckerberg’s address brought to a close Harvard’s 366th Commencement, culminating almost a week of festivities and celebrations to honor Class of 2017, as well as returning alumni celebrating milestone reunions. Among those returning for celebrations as part of the Harvard Alumni Association were members of the Class of 1947, who had been in the audience on the same spot when Secretary of State George C. Marshall gave the speech that laid the foundation for the Marshall Plan to help Europe following World War II. Poet T.S. Eliot and physicist J. Robert Oppenheimer, a creator of the atom bomb, shared the stage with Marshall for their honorary degrees on that sunny June day 70 years ago. 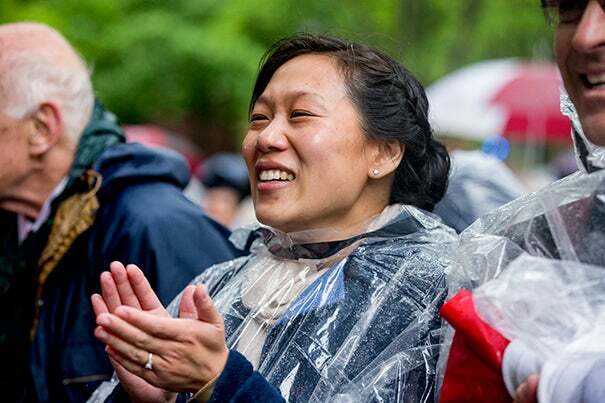 On Thursday, under a steady rain, actors Judi Dench and James Earl Jones, composer John Williams, physicist Walter E. Massey, and human rights activist and physician Hawa Abdi Dhiblawe were among the honorands seated near Zuckerberg during the Morning Exercises. During the Afternoon Program, officially the annual meeting of the Alumni Association, Faust also addressed the crowd. She urged her listeners to consider how to help “actively and affirmatively” enable and nurture free speech on college campuses nationally. Universities are special places where intellectual debate and discussion, evaluation of ideas based on facts and evidence, and rigorous questioning of and pushback against those ideas are essential to advancing knowledge, she said. Free speech enables universities to push for understanding and to uncover truths, something they must constantly strive to do, she added. Faust also touched on the issues of diversity and inclusion in her remarks. During her decade as Harvard’s 28th president, she has helped spearhead University efforts to promote inclusion and belonging. Still, she said, more needs to be done. Faust noted that while Harvard College is more diverse than ever, many students still struggle to feel like they are full members of the community. “We must support and empower the voices of all the members of our community and nurture the courage and humility that our commitment to unfettered debate demands from all of us. And that courage means not only resilience in the face of challenge or attack, but strength to speak out against injustices directed at others as well. "I'm here to tell you finding your purpose isn't enough. 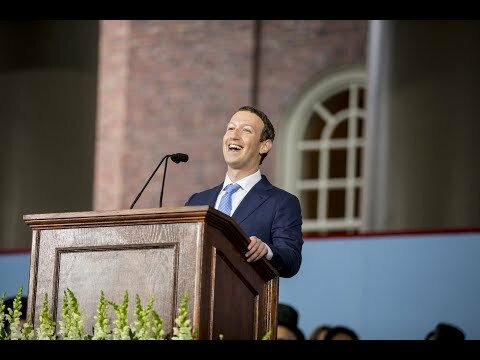 The challenge for our generation is creating a world where everyone has a sense of purpose," said Mark Zuckerberg, who was the principal speaker at Harvard's 366th Commencement on May 25.